The business of marketing depends on sale. Sale depends on upon various other aspects. Not only smartness of seller, but sales also depended on the looks of products. More beautiful the product is, more target audience it will be able to achieve. Same is the case with creating a website. More attractive the website will be more users it will gather for the usage. No doubt, the audience will use the website on a regular basis if the content is good and relevant, but they will go for content check if and only if, they like the design of the website. So, in a nutshell, the design of the website we are working on should be as better as it can be. With the fast-growing business of web designing, it is really difficult for the newcomers to make a design with which they can get the audience on their website. Those, who really want to excel in this field, should learn these two steps. First of all, they should have the complete knowledge of the web development, how the website is made, how content is written and how web development tools are to be applied on their website. 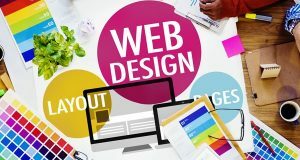 As and when they get the complete knowledge of the basic amenities of the website, they should switch towards the learning of the creation of best designs, the techniques related to best designs. With the guidance of interactive designing, people will be able to create the best designs. However, it is not the complete solution. It completely depends on the creativity of the individual. More creative the individual would be, a better design will emerge. Interactive and best attractive designs involve nothing but the involvement of these 6 steps while creating your design. First of all, you should know, what actually you want to make. Have pre hand knowledge of what you want your design to look like. There must be something going in your mind. Start thinking of the designs as per the theme. Make sure that the design which is going in your mind goes with the amount of content. The best design is not actually the most beautiful website design but the design that looks elegant with the content present on your website. After you thought about a particular design, make a layout of your design using tools such as Photoshop. Check whether the design you made looks nice or not. After you got the layout for your design, start working for the creation of your design. For that, first of all, you need to have the complete knowledge of the web designing languages, the tags which will be required to create that design. Now that you know what tags you will require, what languages you have to go with, start working with the design.